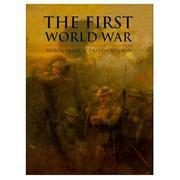 An attractively illustrated (if rather shallow) history of the major events of WWI, Prior and Wilson’s (Command on the Western Front,1992; Passchendaele: The Untold Story,1996) book is part of a multi-volume series on the history of war from ancient to modern times. Packed with striking photographs of battles and prominent individuals, the real surprises in this book are the maps that detail specific military maneuvers through unfamiliar geographies. For example, maps of the complex troop and naval movements around the Dardanelles bring to life the hard choices faced by British and French war planners. Focusing on the great battles in France and Russia, Prior and Wilson also detail significant actions in the Middle East and Africa. Even though important naval engagements are excluded, they will be profiled in a separate volume on the history of warfare at sea. Graphic and editorial details aside, the book is filled with historical and moral judgments that range from the outrageous to the banal. How can any genuine student of military and diplomatic history accept the authors’ tired conclusion that primary responsibility for the war rested with German militarists? We would expect that explanation from French and British diplomats in 1919, not from contemporary historians. Moreover, Prior and Wilson seem to share the French high command’s view of the mutinies that disrupted more than 70 divisions in 1917. They congratulate the generals on their response to the revolt: allowing more leave, bettering living conditions, and only ordering a token number of executions (from 50 to 70). More executions, the authors point out, might have had “dangerous” consequences for military order, as if that value had any legitimacy for anyone but generals after three years of butchery. Prior and Wilson fail to describe the feelings of worn-out soldiers about such lofty values as military order. For that matter, they fail to describe the feelings of any of the millions who faced each other in the mud, citing only the statistics of their deaths. A book that can rest on the coffee tables of military history buffs, serious readers should look elsewhere.